We know what you’re thinking – how unique can a label really be? If you’re imaging a standard four-color, one-sided, square-cut label, there’s only so much one can do to make it both appealing and functional to a consumer. But what you’re likely not thinking of is the variety of customizable, easy-to-use label types that are gaining popularity within a variety of market segments; including food, beverage and consumer products. Since Inland recently acquired two print companies who are masters of creating some pretty awesome custom label (and packaging) types, we decided to share a bit more about what we’re seeing. Here are seven of the unique label types that are popping up in the marketplace and at our locations. Dry peel labels are a type of label that can be peeled away and removed from the product container or package. An adhesive is used to temporarily hold the label in place, but is limited enough to easily peel the label off. Dry peel labels are often used for instant redeemable coupons at point of purchase or to provide additional copy. For example “Peel here to save $5 on your next purchase” or “Peel here for directions.” Another unique thing about dry peel labels is that another label can be positioned underneath them, so when they’re are peeled off there is still content that remains on the container. Fold out labels are labels that fold out to provide additional content. Similar to a dry peel label, fold out labels are often used for instant redeemable coupons or to add additional copy. What makes them different from dry peel labels is that they are constructed of a single substrate that is then folded and stacked. Using an accordion type of effect, the label then unfolds to provide additional copy. A fold out label can also come completely off the container, but rather than having another label underneath it, a fold out label is used in addition to the primary label used on the container. Reseal labels are exactly what they sound like – a label that is able to reseal the packaging or container it comes on. This usually takes place when an opening to the package or container is placed under the reseal label. Reseal labels have been around awhile, but this is a label type that has certainly increased in popularity over the past few years. Reseal labels are the perfect fit for adding convenience and functionality to a multi-use product. Examples of products that utilize reseal labels include lunch meats, snack foods or various types of ready-to-use wipes. Expandable reseal booklets are a bit of a combination of two labels we already discussed – fold out and reseal. By combining these two features, expandable reseal booklets are labels that expand out for more content, but can also adhere back to the container for later reference. These are great to add extended content to a label, especially when your label is constricted to a small label panel. Expandable reseal booklets are often used to explain detailed health and safety information, directions or multiple languages. Labels that have a unique shape or outline to them are usually specialty die-cut labels. These are often used to showcase uniqueness in the label, whether for branding or other aesthetic purposes. Specialty die-cut labels are also helpful when working with a unique container shape, packaging type or label panel. Specialty die-cuts can also be used for interior purposes or for labels that have a removable label within them. We cheated a bit on this one. Laminated tag and board is more of a package than a label, but it’s worth noting that this type of packaging can often be printed in a similar way as a label. By using a thicker board stock as the printing material, laminated tag and board is a convenient way to differentiate and package your product. Once printed, folding of the material is usually done during the packaging process, whether to completely cover the product or to serve as a label of sorts that wraps around the product. Not to mention you can laminate, foil and die-cut tag and board packaging as well. Prime labels refer to the primary label on your container or packaging. This usually consist of the label that has your branding or product at the front and center. What makes these labels so special? 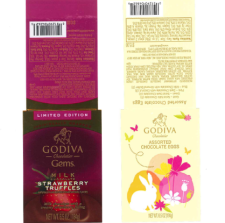 A variety of enhancements can be used on a primary label to make them stand out from the rest of your packaging. For example, primary labels can have foil stamp, matte and gloss finishes, tactile varnish, back-sided printing, specialty coatings and variety of other specialty features to enhance their shelf appeal. While we could keep going on these unique label types, we’ll leave you with these seven for the sake of this blog post’s length (but that doesn’t mean we won’t be back with more unique label types later). Until then, don’t forget that just because we’ve said these unique label (and packaging) types have typical uses, doesn’t mean your brand couldn’t think up a more creative way to utilize them. Share your ideas with us or request some free samples today.